Chocolate milk is a beautiful thing. And it’s even more beautiful (and yummy!) when made with homemade chocolate syrup. And since we’re talking beautiful, let me tell you, a homemade chocolate syrup with only 5 1/2 pronounceable ingredients (because seriously, does a pinch of salt count as a full ingredient?) that takes minutes to prepare…well, that is definitely a beautiful thing. 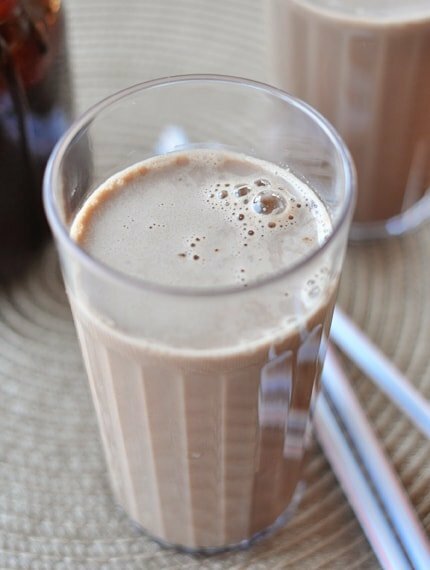 Chocolate milk is a splurge at our house and my four boys are giddy with excitement when I offer it as a beverage option. Um, yeah, we probably need to get out more if my declaration of “let’s make chocolate milk!” induces cartwheels, brotherly chest bumps and all around circus mania thrills. Up until now we’ve used Ovaltine or Trader Joe’s chocolate syrup as our chocolate milk mix-in but I can easily and confidently say that this chocolate syrup will be replacing both of those. The flavor is deep and rich and absolutely perfect. And the resulting chocolate milk is…well, beautiful. I’m off to slurp some chocolate milk with my kiddos. Meanwhile, if you are in the throes (or will be soon) of school lunch making, here’s a post I wrote last year on the matter. I’ll be beefing it up with some new ideas in the next few months as soon as we get moved and settled and my brain can process thinking about school lunch ideas instead of how to fit our 7-person family into a 1300 square foot rental home (and the subsequent train of thought which usually includes wondering if it would be unethical to have a child sleep in the bathtub in order to make room for my Bosch mixer and beloved wheat grinder somewhere – um, now that I actually typed that out I feel inclined to say: no comment needed thankyouverymuch). In a medium saucepan whisk together the brown sugar, granulated sugar, cocoa powder and salt until combined. Add the water and whisk until combined and no lumps remain. Heat the mixture over medium heat and bring to a boil, whisking often. Reduce the heat to medium-low and simmer, stirring occasionally, for five minutes, until the mixture is slightly thickened. Remove the pan from the heat and stir in the vanilla. Pour the sauce into a mason jar or other lidded container, let it cool to room temperature, and cover and refrigerate. Stir in a spoonful or two of the syrup into a glass of milk (adjust the amount of chocolate syrup depending on how chocolatey you like your milk). I can't tell you exactly how long this syrup will keep in the refrigerator. It all depends on the freshness of your ingredients and other factors I'm not really familiar with since I'm not a certified food scientist (or a certified anything for that matter while we're on the subject). Personally, I'm comfortable enjoying this delicious syrup for two weeks or maybe even up to a month but use your own judgment! Recipe Source: from Slow Roasted Italian sent to me by my friend, Kim (in MD)! Just made this again and love love it! I stirred it into my soy milk and it worked great! I love this recipe. I use it all the time and wanted to come back and tell you…and to let you know that I’m featuring it on my new blog, The Prudent Home, giving you all the credit of course. 🙂 Thank you so much! Thanks, Pamela – happy you love this! also is there a recipe for strawberry syrup? can u explain to me how tthis blog following works! i enjoyed this recipe and wish i knew this years ago. i would like to enjoy more of your blog info. Kim – I am glad you are enjoying the recipes! You can follow THIS link to subscribe and get e-mails when a new post goes up. I have made this recipe approximately nine bazillion times since Mel first posted it. But, today was a first. I poured the cooked syrup into my crockpot with a gallon of milk and made the best hot chocolate. It was a hit with our cub scout troop and parents. I just might make it again next week for Christmas morning. Richard – I’ve never tried it with hot cocoa. Sorry! Does anyone know if this would freeze well? I have a 2 year old son who drinks chocolate milk but not enough to use the whole recipe in a few weeks time. I was wondering I if I could make it and just put half in the freezer until we run low. Any thoughts out there? Jaime – I’ve never frozen this. You could always make half a batch at a time if you want a smaller quantity (or experiment freezing to see how it goes). I just made this and added two spoonfuls of honey. Ummm sooo good! Totally tastes like the organic chocolate milk I usually buy in the store. This is really good! It makes delicious chocolate milk, and it also makes a great ice cream topping. Thank you for sharing these great recipes! I went home and made this. It is so good. I like that it is not heavey like syrups that use corn syrup. It is me perhaps, but I am liking the deeper flavor it gets from sitting in my fridge for a week. You mean to tell me I had all the elements of chocolate syrup sitting in my pantry all this time? Now my chocolate milk cravings will never go unanswered. This is revolutionary. This was fantastic! I made it last night and poured some warm on ice cream, I was a pretty popular mommy ! Just wanted to say we make this same recipe (I use old squeeze jelly containers for it). It is also good as a dipping sauce for bacon. And I am toying with trying to make it using splenda and splenda brown sugar. What do you think? I am thinking (hoping!) the cocoa will cover any aftertaste or “diet” taste. I kinda thought if it was a bomb, well, I’d just make a sugar batch and mix the two together and see how that goes. Vieve – I included a note in the recipe that I’m not exactly sure how long this will keep. It doesn’t have ingredients that easily spoil, but I’m also not a food scientist so I hesitate to tell people it will last forever and then have someone get sick. My rule of thumb is about a month. Hope that helps! Jone, after refrigerating, the consistency of this syrup is slightly thicker than storebought chocolate milk syrups but not overly so. It is still pourable. Bliss – I stored mine in a canning jar (a quart size but it was on the larger side of things). 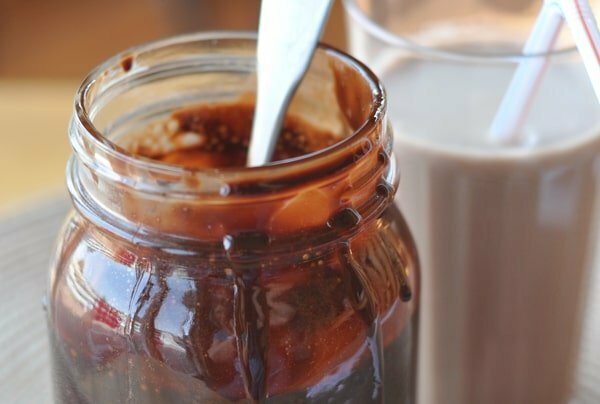 A pint jar would work, too, if you want to use the excess syrup in chocolate milk right away after it cools. Bless you. My oldest won’t drink milk unless it has a squirt of chocolate in it. This is perfect! What a great idea. I have never made my own before. I will have to try this! Wait, should that be “muchAS gracias”? Oh I’m embarrassed now. Muchos gracias. This above almost everything else is what I’ve been craving this pregnancy. I’ve restrained from buying Hershey’s (“Genuine Chocolate FLAVOR” – ha!) and this will be oh so helpful. I hate moving. Into a smaller place…good luck. Hopefully it is a very temporary rental, eh? This look great. My husband loves Choc. milk. I love your blog and recipes. You are the nicest and most kindest person for helping so many people with ideas/recipes. Thanks for posting this! I haven’t bought syrup in a long time, and my kids are dying and wishing for it. But it always seems like an unnecessary extra splurge when my cart seems so full of essentials. So, it’s nice to know I can whip it up with stuff I always have at home! YEAH! Looks and sounds delish! Is it any more fudgy than bought syrups? Can’t wait to try this. I, too, buy the Trader Joe’s chocolate syrup, which is organic and delicious. So I can’t wait to see how this compares. 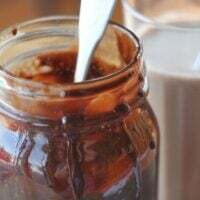 I’ve made homemade chocolate syrup before but the recipe I used called for corn syrup, which I am so not a fan of, and the end result was just ‘all right.’ I’ll have to give your version a try to see if it can really replace the store bought stuff that my family loves so much! I can’t wait to try this and compare with store bought ones (because I don’t really like store bought ones)! Looks incredible! Hah! I am not sure that syrup would last long enough to make it into a glass of milk! It looks delicious. Good luck with your move. This is such a great idea! Love it and will definitely be trying this soon! I love making this stuff! It’s essentially simple syrup with cocoa added. Simple syrup keeps indefinitely in the refrigerator and most bartenders keep flavored syrups on the counter. It’s more likely the sugars will crystallize before anything else. And crystals can be fixed by adding a smidge of water and reheating it until the sugars dissolve. You can make lots of other flavors, my boys like rootbeer, vanilla, caramel, strawberry, and chocolate. The flavor possibilities are endless, just check out the extracts and candy flavorings. We also use them to flavor shakes and other drinks. We made toasted marshmallow chocolate shakes the other night using homemade simple syrups. Good luck with the new living quarters. Our family of 6 (3 boys and 1 girl) live in a 1200sq ft apartment. It is possible to not feel too cramped. My thing is: if you don’t need it, don’t move it and I have to have shared living space (dining/living/kitchen) free of clutter. Kids’ stuff goes in kids’ rooms, not the shared space. We went from a 2400 sq ft house to this apartment and this place feels cozier and easier to deal with (not to mention much quicker to clean). Love this! My kids love chocolate milk but I refuse to buy certain brands because of the corn syrup. Love the DIY version! Have a great week!! Well, that settles it…you’re officially the coolest mom on the planet! You can use xylitol, which is a natural sugar substitute, cup for cup in any recipe. I’ve made breads, cookies, and lemonade with it, so I’m sure it would be fine for this as well. I wish people would definitely not resort to Splenda products and all artificial sugars like it..that will just cause brain tumors…please not at all an acceptable way to get away from sugar rather just to create worse trouble. Stick with the sugar. While I agree with your comment about Splenda products, xylitol is different. As long as you source it from non-GMO places (birch trees, oats, berries) instead of GMO corn, xylitol is an incredible sugar stand-in that it prevents tooth decay, is low on the glycemic index, and increases the absorption of B vitamins and calcium. Sugar, on the other hand, directly contributes to diabetes risk, tooth decay, obesity, poor brain health (linked to Alzheimer’s), and memory loss. Has anyone tried this recipe with a natural substitute for the granulated sugar? If so, please share your results. This is ridiculous ! I’m pregnant and every time my doctor tells me I’ve gained too much weight, I’d like to tell her : “Well, it’s not my fault ! You should talk to that Mel from Mel’s Kitchen Cafe, because she makes me try all these good recipes I’m craving for !”. And then I feel stupid and cry instead ! Haha ! This is awesome! We’re almost always running out of chocolate syrup or Nesquick, so this is a great recipe to have! 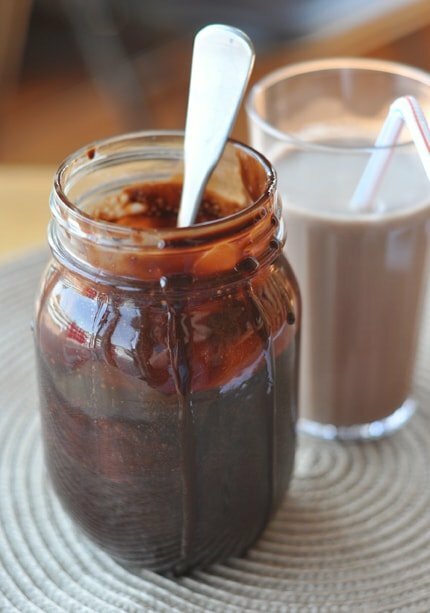 I´ve been looking for a good homemade choco syrup, since it´s hard to find it here. Will be trying this asap and letting you know! All the best on your move, may it be for the best and have you all smiling and settled in no time! After savoring your homemade hot fudge, (which is SINFULLY delicious!) I have no doubts that this will satisfy our chocolate milk loving family! (Just wish it came before I bought more syrup yesterday!) What size container will I need to store this in? I love when you do homemade treats that are better than store-bought!